Chip Reece answers a question posed to him by Zaylee Werth, a sixth grade member of the Hillsboro Middle School Council. 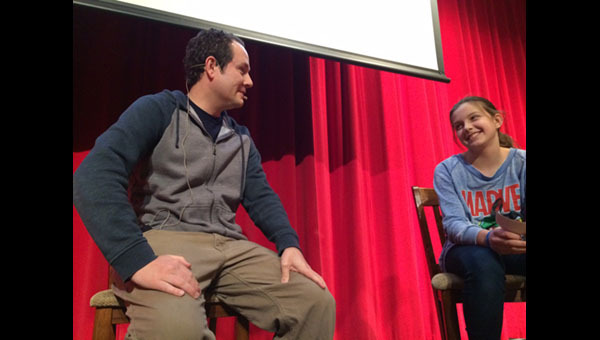 Chip Reece, a 1999 graduate of Hillsboro High School, spoke to middle students during an “Book Talk” Feb. 9 in the school’s auditorium. Janet Whisenhunt, director of the Wiebe Media Center, said Reece started his career right in this same building. “He was involved in sports and drama, but after graduating he went on to Northwestern College in Iowa majoring in social work,” she said. Introduced as the hometown super hero, six Hillsboro Middle School council members asked Reece a series of questions ranging from what inspired him to write a comic book to how does one become a writer. Prior to answering questions, Reece admitted he wasn’t a good student, but that he did want to be a comic book artist. Looking back, he said it was an unrealistic dream, because he became a social worker, and further that he couldn’t draw, but he could write. “I was way off from that original goal, but surprisingly I came back to the comic book,” he said. Reece and his wife, Amy, had a baby boy about 8 years ago, and before his birth, they found out their son, Ollie, had some Down Syndrome characteristics. Initially, he said, Oliver, “Ollie” went through a lot of medical issues to include two heart defects that lead to open heart surgery at 10 days old. “The medical professionals didn’t have a lot of hope he would live through it,” Reece said. When Ollie was three months old, he had a tracheotomy, which opened up his airways so he could breathe. For those reasons, and a lot more, Reece said, Ollie became his super hero. Down syndrome is also known as Trisomy 21, which is caused by an error in cell division and results in three copies of chromosome 21 instead of the usual two, he said. “People with Down syndrome tend to have a lower than average cognitive ability, and often are mild to moderate development disabilities,” he said. About 50 percent of children born with Down syndrome, he added, will have a heart defect, and in Ollie’s situation he had two defects. One in about 700 children will have Down syndrome, he said, making it one of the more common disabilities. One of the council members asked Reece how students should act around someone who has Down syndrome? Reece said we need to treat others the way we would want to be treated. “One thing to remember is that no matter what kind of disabilities we have, where we come from and how we look—we all have dreams and need room to chase those dreams,” he said. Reece shared some famous people who persevered and followed their dreams. For one teenager, Elisha Reimer, 15, was the first person to climb Mount Everest. Another teenager, Madeline Stuart of Australia, became a model, citing that she was the first model with Down’s syndrome. Metaphase proves that comics truly are for everyone—heralding the next phase of diversity in comics in which characters with disabilities push comics forward and challenge us to rethink what it means to be a hero, said one critic. The story is about a boy named, Ollie, who has Down syndrome and wants to have powers just like his superhero dad. But with congenital heart defects, Reece said, his father has no intention of letting his son get in harms way. Reece said he didn’t want to give away too much of the story line, but hoped that they would read the book themselves. “I will leave the rest for you,” he said. Another question that was if there will be a sequel to Metaphase? Currently, Reece said he is working on that idea, but it takes money and he is planning a fundraising idea. Ollie continues to smile, and it keeps my heart in check. That’s my man, my super hero and my inspiration,” he added.